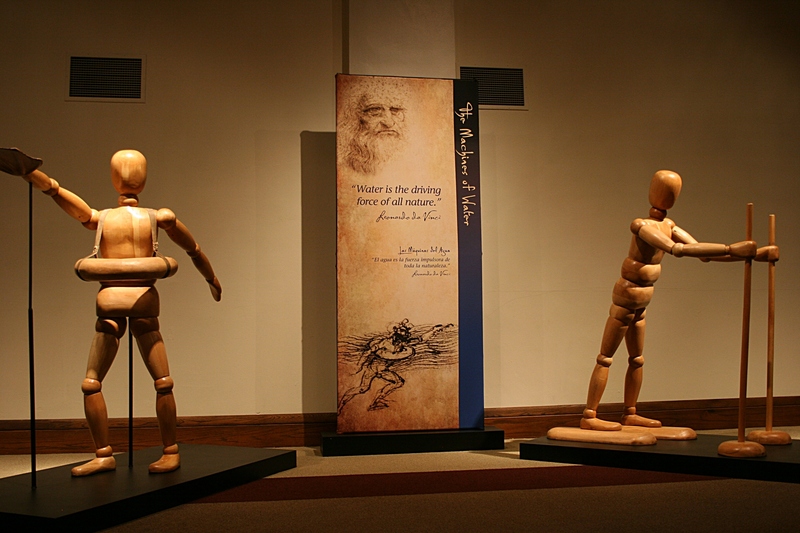 Another facet of Leonardo da Vinci, on exhibit in Appleton, Wisconsin. QUICK. When I say “Leonardo da Vinci,” what pops into your mind? For me, it’s his “The Last Supper” painting. 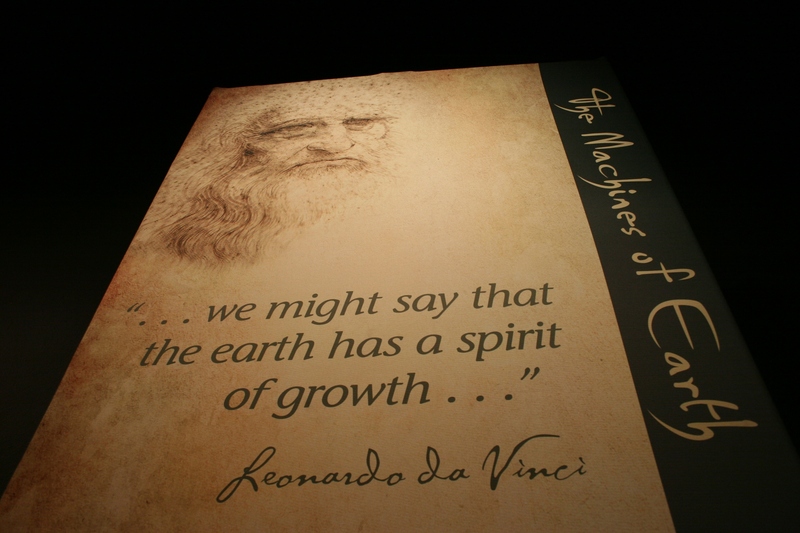 Inside The History Museum, a sign welcomes visitors to the da Vinci exhibit. I do not even think of him as a scientist or inventor. But this Renaissance man surely was, a fact emphasized in a current exhibit originating in Florence, Italy, and currently showing at a northeastern Wisconsin museum through January 6, 2013. 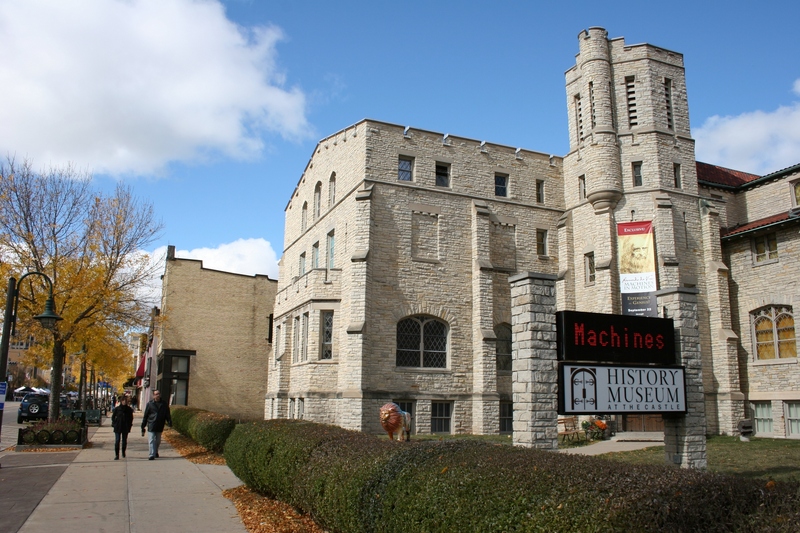 The History Museum at the Castle, 330 W. College Avenue, Appleton, Wisconsin. 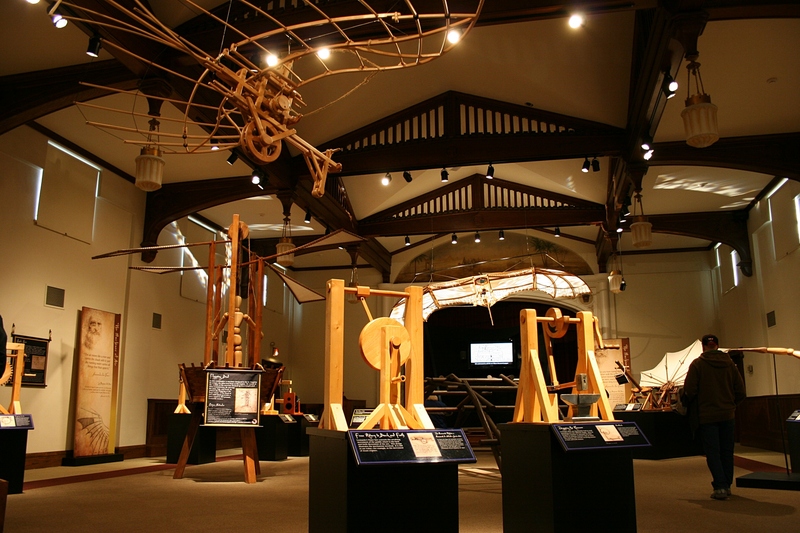 Two months ago I toured “Leonardo da Vinci: Machines in Motion” at The History Museum at the Castle in downtown Appleton, a hip and historic city some 300 miles from my southeastern Minnesota home and today home to my daughter Miranda. An overview of one exhibit room, a working crane in the front and a tank in the back, right. Typically I would not get particularly excited about a show which features mechanical-oriented displays. 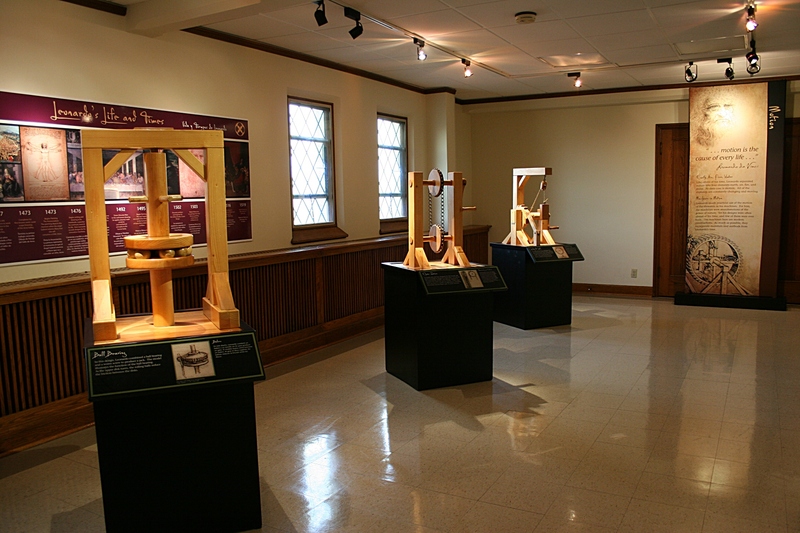 But given da Vinci’s notoriety and my interest in art and in sharing discoveries with you, I embraced this working models exhibit of 40 da Vinci machines. 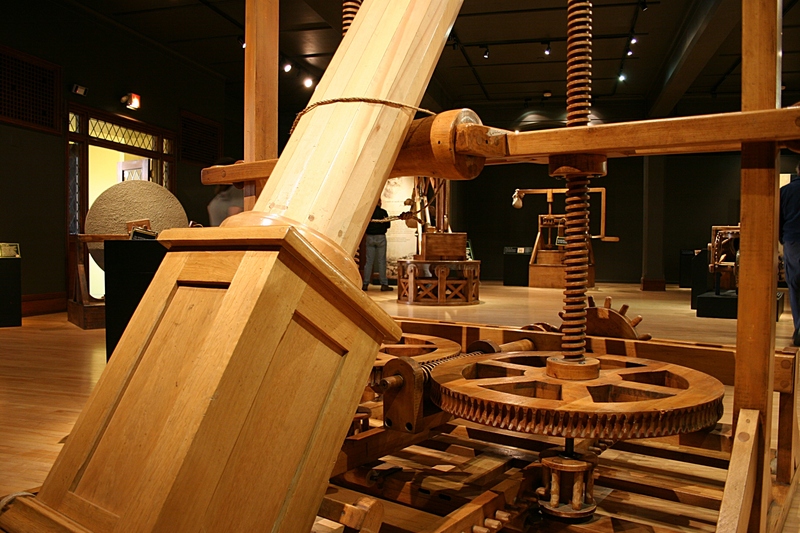 Modern day scientists and artisans built the machines based on da Vinci’s codices. This is an interactive exhibit. 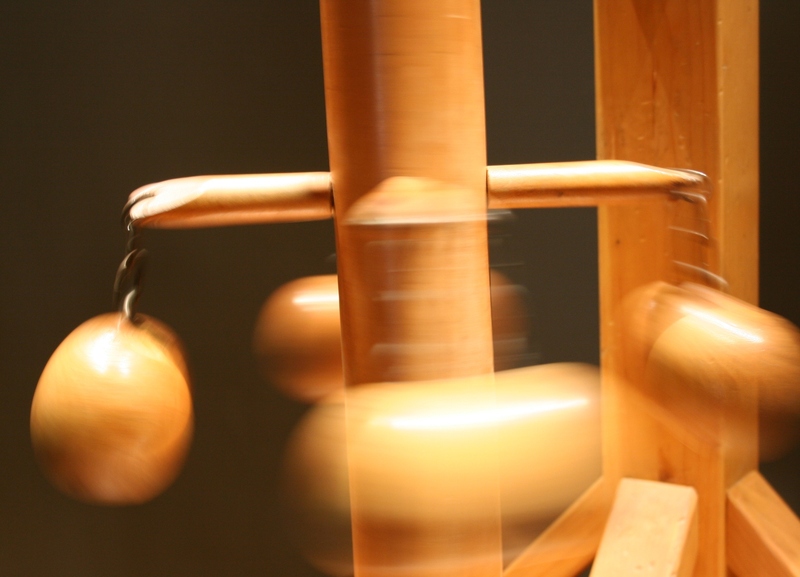 Kids will thrill in “Machines in Motion” as much as adults. Perhaps more than anyone before him—and perhaps anyone since—Leonardo was a great scientist, engineer, and artist all in one. He combined a scientist’s passion for exploring how things work and an artist’s ability to vividly illustrate his revelations. His machine designs were ingenious and visionary—often ahead of his time. They illustrate principles at the heart of machines today. 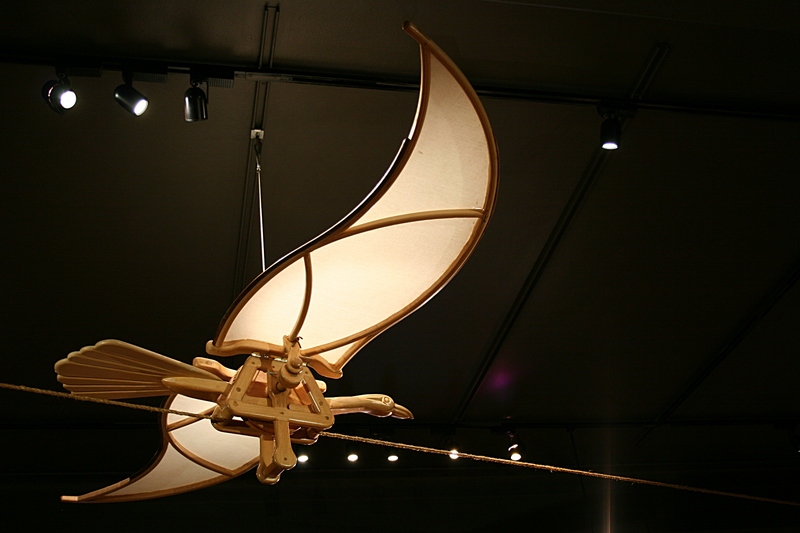 One of da Vinci’s more impressive flight designs, suspended from the ceiling of an auditorium at the History Museum. In his study of air, water, earth and fire, this genius—and I don’t hesitate to term someone of da Vinci’s intellectual and artistic talent as thus—created ideas which evolved into workable solutions aiding mankind. An illustration by the scientist/inventor, Leonardo da Vinci. 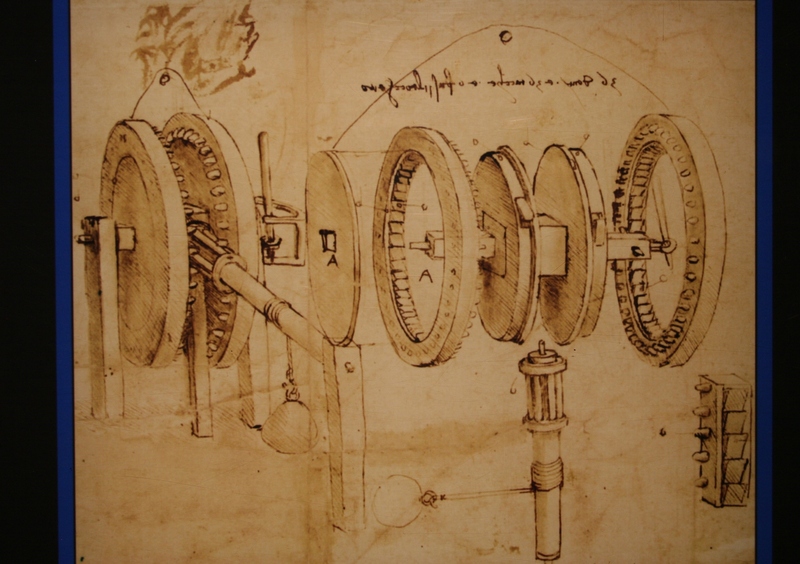 Machines created from da Vinci’s codices. 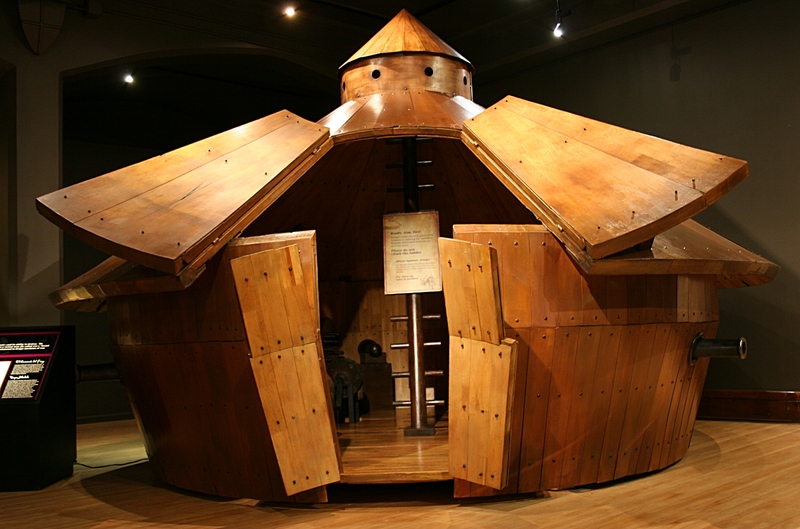 Da Vinci’s version of a horse-drawn armored military tank. 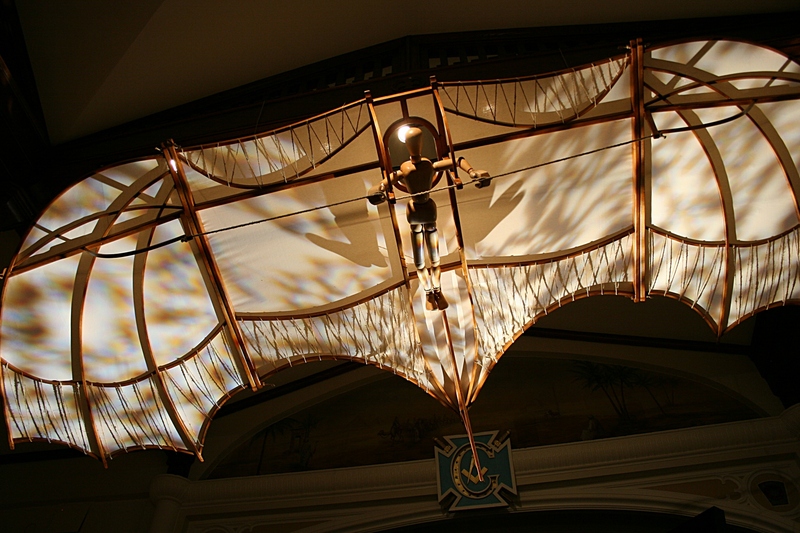 The bird’s wings flap as it moves across the stage during theatrical performances. Da Vinci the artist and da Vinci the scientist. Da Vinci’s idea to traverse water. Disclaimer: I received a $25 gift certificate from Downtown Appleton, Inc., prior to my visit and used that money toward museum admission for myself, daughter and husband. That did not influence my decision to post about the da Vinci exhibit. Wow! That was an interesting tour! Never would have thought all that would have been on a tour and not just in a permanent exhibit. Incredible! I expect it took awhile to set up. And we almost missed the second floor of the exhibit because it’s kind of tucked behind the Harry Houdini exhibit. More on that in another post. Yes, Houdini claims Appleton as his birthplace. Hmm…never knew much about him so looking forward to that post, too! I’m with you. There are so many facets to that man’s persona that he could be studied for years without repeating his attributes. He was brilliant, most definitely. His artistry is thought of first (paintings/sketches) but his genius in the field of physics/sciences is more intriguing to me. Wonderful post! I know our science-oriented son would have loved this da Vinci exhibit. But, alas, he was 10 hours away in Fargo, hopefully studying at NDSU. This “Fargo thing” has really impacted your lives, also….who’ld a thunk it!!!!! 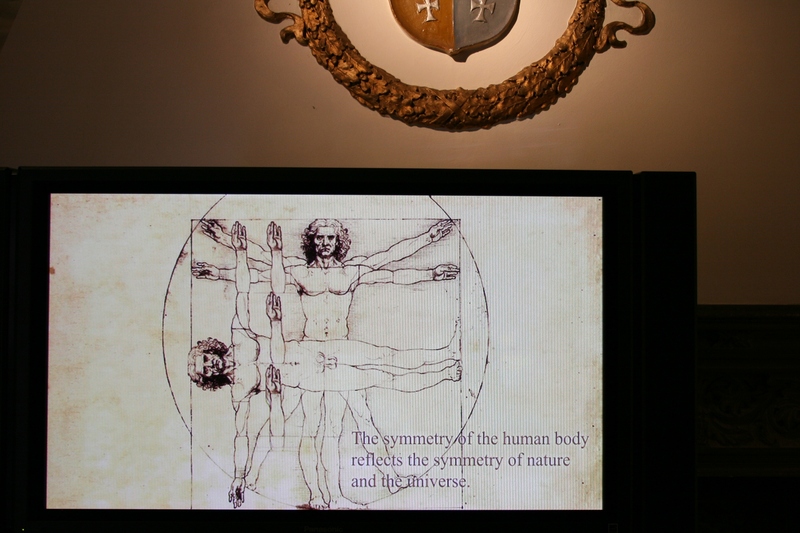 The mechanical/scientific side of me has always been fascinated with da Vinci! 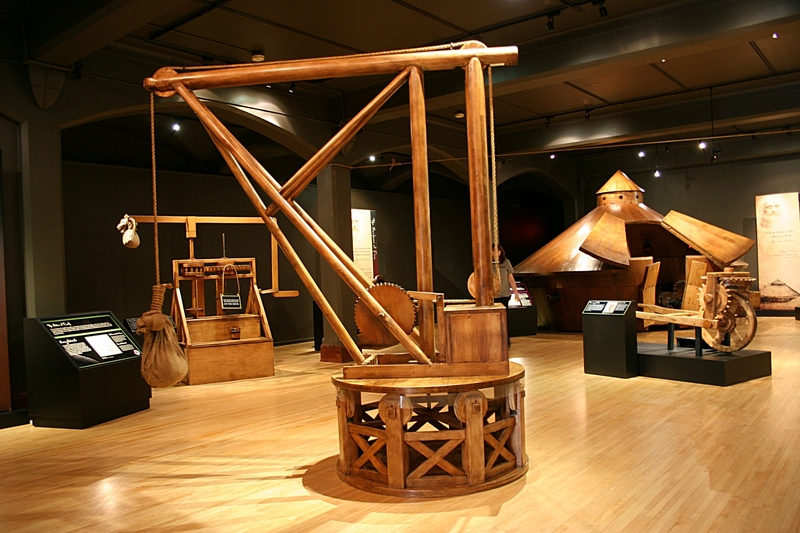 The da Vinci exhibit is in Wisconsin. Yup, two kids living 10 hours apart. One east. One west. And then one nearby in Minneapolis, whom we don’t see all that often either. Interesting! I actually do think of Da Vinci as an inventor. My husband would love this exhibit. I wonder if there’s any way we can find time to get up there before it ends. Maybe we could even do it as a day trip. We’ve gone to Sheboygan and Fond du Lac on day trips. Thanks for sharing this! And the bonus is the permanent Harry Houdini exhibit at The History Museum at the Castle, plus the local exhibit in the basement. You can easily spend several hours here. Appleton is an hour or so from Fond du Lac (I think). Also if you love old buildings, you will love downtown Appleton. I’ve also toured the Hearthstone Historic House Museum (an old mansion), the first home in the world lit by a hydroelectric central station, and the Paper Discovery Center. I would also like to visit the Trout Museum of Art. So much to see and do in Appleton, a beautiful city along the Fox River. You are most welcome. Always happy to share my photos with readers like you and take you to interesting places. My son Shawn loved Leonardo da Vinci when he was younger and we had a book or two around here about da Vinci’s inventions. Funny little aside – Shawn also loved the Teenage Mutant Ninja Turtle named after Leonardo da Vinci and when he realized the connection, that made it even better. Ah, the educational power of cartoons. Oh, the Teenage Mutant Ninja turtles…my girls loved them, just loved them. The son was too young for that craze. I even made a Teenage Mutant Ninja turtle birthday cake for one of my daughters one year. I never really thought, though, about the reasoning behind the turtles names. Too busy focused on mothering, instead of art, apparently. 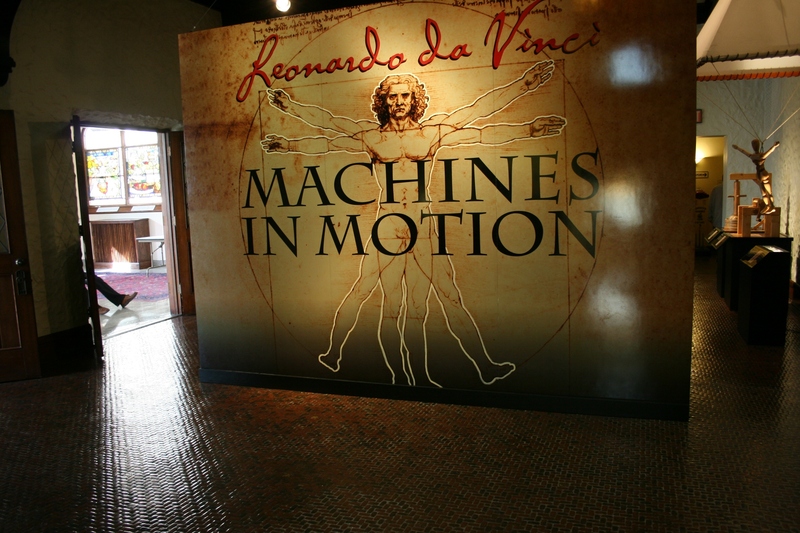 We can’t thank you enough, Audrey, for sharing your reaction to the Leonardo da Vinci: Machinies in Motion exhibit here at the History Museum at the Castle, and all of your fantastic photos. You, too, are an artist! 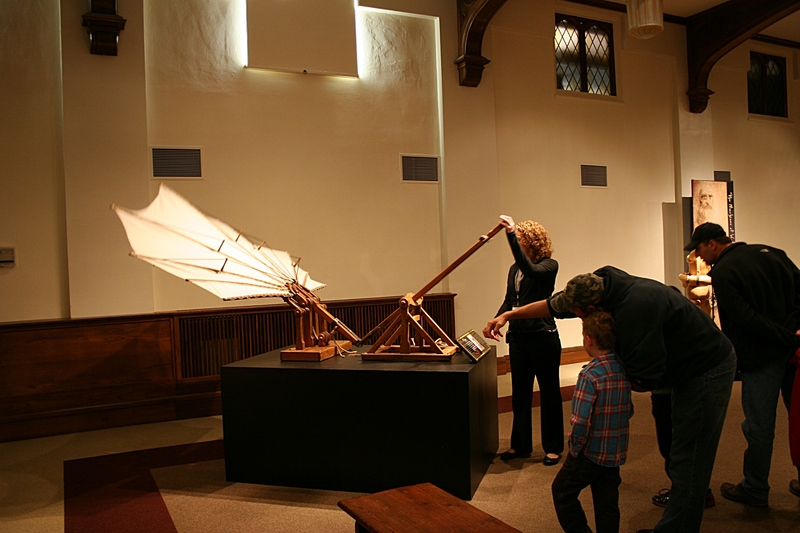 Leonardo appeals to and fascinates all ages, whether you are a student of art or physics, and even if you just like to give anything mechanical a whirl! As you noted, visitors can operate almost all of the 40 machines; the exhibit text that accompanies each display is provided in English and Spanish. Allow plenty of time for a visit, as you also can explore the interactive “AKA Houdini,” the “Tools of Change,” and the “From My View: the Photography of Andrew J. Mueller” exhibits. You can also learn about Wisconsin’s infamous Sen. Joseph McCarthy here. We aren’t all that far from our friends in Minnesota, and welcome you to bring family and friends during the holidays. This exhibit won’t be anywhere nearby, so be sure not to miss it. Best wishes! You are most welcome, Kathy. We thoroughly enjoyed our visit. I’ll be publishing an additional post of the Houdini exhibit and probably a few pix from “the basement” too. Loved Andrew Mueller’s photos. Just loved them. Thanks for pointing out that the exhibit text is also in Spanish. I’m surprised my Spanish interpreter daughter did not point that out to me. Appleton is a 5 1/2-hour drive from Faribault, my southeastern Minnesota home. Too bad you’re across the ocean because you would absolutely love this exhibit. Maybe it’s coming to a place near you. Looks like a fascinating exhibit. Very cool. Oh, yes, you would enjoy the Leonardo da Vinci exhibit. If only it wasn’t so far from Bigelow, huh? Yeah, that’s a ways to go! This looks like a great place to check out. Thank you for that update, Kathy. I’m still planning a post on the Houdini exhibit. Awesome! There’s still time for your followers to visit.